St Austell Brewery Visitor Centre tells the fascinating story of traditional brewing in Cornwall over the past 150 years. In 1851, Walter Hicks turned his back on a 400-year old family tradition and mortgaged his farm for £1,500. From his fields above Luxulyan he could see Cornwall's industrial future taking shape and he would ensure it had plenty to drink! Hicks, was an incredibly successful entrepreneur who learned his new trade, first as a maltster, then a wine-and-spirit merchant, before building his first brewery in 1869. 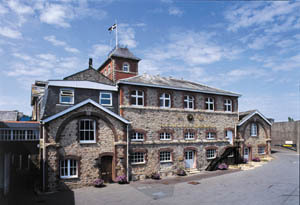 Within 25 years the business had outgrown the building and The Walter Hicks Brewery was established on the present panoramic site above St Austell. Since then there have been alterations and improvements but the essential "brew-house" of 1893 is still the working heart of the brewery today. The Visitor Centre offers guided tours around the fully working brewery, which will give you a fascinating insight into the brewing process and industrial methods, which have changed only in detail in 150 years. Overseeing the process are descendants, not only of the Hicks family but the brewers who joined the Luxulyan farmer at the birth of his venture. On the tours you will be given the opportunity to sample some of the brewery's delights and better still, the Visitor Centre has a fully licensed gift shop which stocks the full range of beers and spirits produced by the brewery for you to purchase and take home with you. St Austell Brewery Visitor Centre is a fascinating insight into traditional brewing methods and the history of Cornish ale.